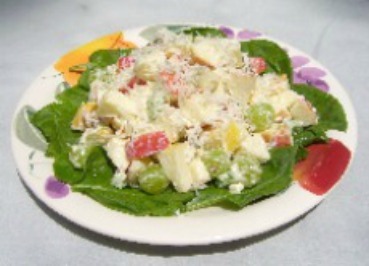 Waldorf Salad Recipe is an old fashioned salad made with apples, apple juice, mayonnaise, celery, grapes, pecans, and coconut. The original recipe was created by Oscar Tschirky, dinning room manager at Waldorf Hotel, in New York City about 1893. His version contained only celery, apples, and mayonnaise. My first cook book listed walnuts and french dressing. It was not good. Then I found a recipe that contained grapes and lemon juice. Instead of walnuts and grapes, I used pecans and raisins. Years later, I ate the perfect salad in a local cafeteria. The chef refused to share his recipe. I took a dogie bag of salad home and started my usual tasting analysis to duplicate the dish. Here is the secret recipe. Use fresh grapes. They are juicier, not as sweet as raisins, and enhance the coconut flavor best. In a 2 qt. (or larger) mixing bowl, mix the mayonnaise and apple juice until there are no lumps. Add apples and stir to coat well. Fold in celery, raisins or grapes, and nuts. Chill in the refrigerator a few hours for best flavor. When ready to serve, place a lettuce leaf or a few fresh spinach leaves on salad bowl or plate. Pile apple mixture in center and sprinkle with coconut. This dish is excellent with turkey or chicken entrees! Add apples to mayonnaise and apple juice mixture as you cut them up, to help prevent them from turning dark.